Summer is the quintessential time to travel and explore new places — and I think it's safe to assume that New York City is at the top of many of our "places to explore" lists, even if we're born-and-raised New Yorkers. As it well should be — while some people venture to beach towns or plan tropical getaways to the islands during July and August, a summer in the city can be pretty awesome, too. I mean, who can resist the lure of the world-famous concrete jungle? Whether you're into cheap drinks, fancy dining, gorgeous rooftop views, or anything in between, there is truly something for everyone here (even if you're just staycationing). After two glorious years of living here, one of my favorite New York City neighborhoods is the East Village. Notorious for its hipster-cool vibe, to-die-for eats, and underground speakeasy bars, the East Village has a long history as a place full of art, nightlife and excitement. If you're heading to the Big Apple this summer, you'll want to check out a lot of different neighborhoods throughout the five boroughs that make up the city — but you really must check out these East Village hidden gems for a guaranteed amazing experience. Ready to make some awesome, long-lasting memories? 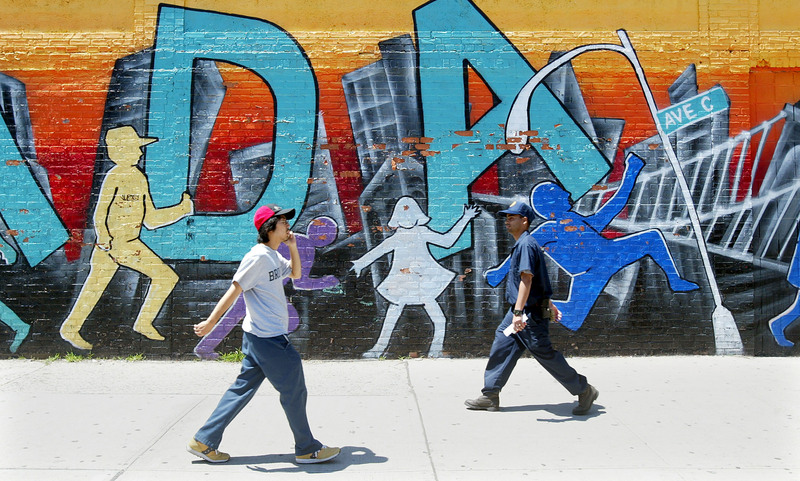 Then dig into this guide to spending the summer in one of New York's trendiest neighborhoods. This al fresco italian hotspot — notorious for its stunning décor and impeccable ambiance — is located at the Bowery Hotel. The menu is pretty incredible too — popular items include the Regalo Verde, a jalapeño-infused tequila cocktail with St. Germain, basil, and lime, and the Calzone di Nutella, a flaky calzone stuffed with nutella and creamy ricotta. Now that's what you call mouthwatering. The outdoor seating at Narcissa is as swanky as it gets. Located in the Standard Hotel, the upscale private garden is reminiscent of a country home backyard, complete with pastel-colored furniture and lots of fresh greenery. Make sure to grab the fresh and tasty avocado toast or the vegetarian lasagna with forest mushrooms. This new authentic Mexican hub has an adorable outdoor area adorned with fresh flowers and hanging tin lights, giving the place a casual yet inviting vibe, and making it a prime place to hang out all day long. The food is finger lickin' good, especially the beer-battered fish tacos and the carne asada skirt steak. Definitely my new favorite Mexican spot. Hidden inside a storefront that looks like your average little hot dog shack is PDT, a luxe cocktail bar. To enter, step into an old-fashioned, floor-to-ceiling telephone booth, where you will find a secret side door. Once inside, the sultry dim lighting, deep mahogany wooden bar, and opaque leather detailing create a super intimate and sensual vibe, perfect for date night. If you're a whiskey lover, make sure to try their Old Fashioned cocktail — it's the best in the city IMO. Located behind a completely unlabeled door in a Japanese restaurant on Stuyvesant Street, this sophisticated cocktail bar is truly a hidden gem. Complete with a menu of hundreds of unique drinks, tuxedo-wearing bartenders and a gorgeous angel-inspired mural covering the front wall, Angel's Share is definitely a must-see. Don't leave without the trying the Summer Breeze cocktail, which literally has island-shaped ice balls inside of it. If you're looking for a place to totally let loose and get your groove on, look no further than Bowery Electric. This bi-level dance spot offers up a wide variety of music, including live rock and DJ shows, catering to many tastes. Dream Baby's awesome and eclectic selection of tunes — complete with old school sing-a-longs to classics like "Sweet Caroline" — will literally have you dancing all night long. This hotspot is quickly growing in popularity and is probably the closest thing to a real "bottle service and all" club in the East Village. You can't get very far in the East Village without stumbling upon one of Bradley Theodore's brightly-colored skeletal portraits. This up-and-coming artist's gorgeous modern art work is scattered all over downtown's streets, and they are definitely a sight to see. The cover art for Led Zeplin's sixth album, Physical Graffiti, was actually shot right on East 8th St. and St. Mark's Place back in 1975. The band chose the historic building for its asymmetrical design and geometric windows. Comparing the album photo with the building IRL is pretty damn cool. The best part about Saxon & Parole's brunch menu is their DIY Bloody Mary bar. Yes, you can actually craft your very own bloody, filling it up with anything from bacon to jalapeños to horseradish. The food is top notch, too — the baked eggs are an absolute must-have. Cafe Cortadito's authentic Cuban brunch dishes will leave you wanting more. And if you're in the mood for something a little different, try the sweet plantain omelette or the lobster benedict — you won't regret it or forget it. Plus, their mimosa and Bloody Mary deal — a whole pitcher of the drink, for only $30 — can't be beat.